Professor James A. Momoh, Ph.D.
James Momoh received a BSEE degree (1975) from Howard University, a MSEE degree (1976) from Carnegie Mellon University, a MS degree (1980) in Systems Engineering from the University of Pennsylvania and a Ph.D. degree (1983) in Electrical Engineering from Howard University. He was Chair of the Electrical Engineering Department at Howard University and Director of the Center for Energy Systems and Control. In 1987, Momoh received a National Science Foundation (NSF) Presidential Young Investigator Award. He was Program Director of the Power program in the Electrical and Communications Systems (ECS) Division at NSF from 2001-2004. Momoh is a Fellow at the Institute of Electronics and Electrical Engineering (IEEE) and a Distinguished Fellow at the Nigerian Society of Engineers (NSE). He was inducted as a Fellow Member of the Nigerian Academy of Engineering (NAE) in 2004. Momoh's current research activities for utility firms and government agencies span several areas in systems engineering, optimization and energy systems control of terrestrial, space and naval complex and dynamic networks. These include but are not limited to the development of multi-agent, intelligent optimization technologies; next-generation optimization for the design of future intelligent power grids; computational tools and algorithms for deregulated/restructured power economies; and advanced power management strategies for stressed power systems with uncertainty, dynamics and stochasticity of parameters. He has also led research and education outreach and collaborations in information technology, environment, energy and human capacity building to involve the United States and other countries worldwide. 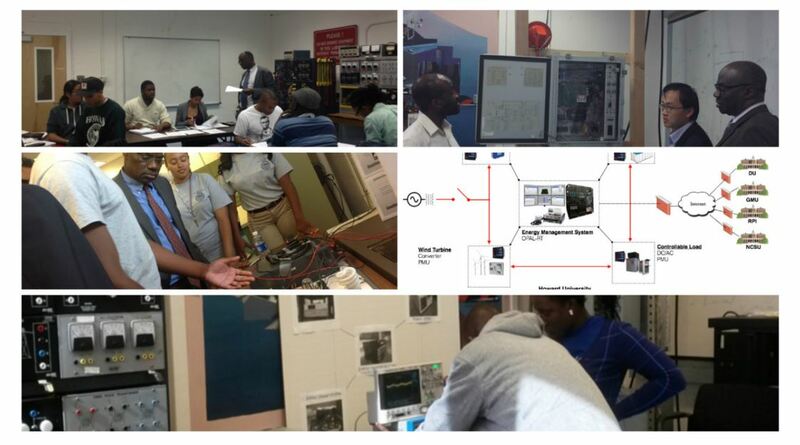 This has led to a number of international conferences, workshops and seminar series, and research and education in engineering programs that are sponsored by NSF, Howard University and several universities and public-private agencies. Presently, he is developing interdisciplinary research and education programs in power, economics and environmental adaptive systems. The goal is to build cross-disciplinary partnerships among engineering, economics and other related disciplines that address socioeconomic issues, environmental issues, new teaching pedagogy and curricula to prepare the workforce of the future. Momoh's research and professional activities have led to over 225 technical papers in refereed journals, transactions, proceedings and also production of several textbooks in his areas of expertise. These papers are presented at conferences, workshops, seminars, tutorial sessions and several other IEEE events to benefit the wider community of engineers, students and policy makers. He has contributed to and is engaged in the development of specialized computational applications of classical optimization, intelligent systems and advanced optimization techniques for the new tools needed by terrestrial, naval and space power systems. In particular, he has been developing special topical contributions in the area of Dynamic Stochastic Optimal Power Flow (DSOPF) using Adaptive Dynamic Programming (ADP) methods. His activities also extend to the development of Multi-Agent Systems (MAS) for coordination and control of complex power systems. His work continues to impact the research and innovations needed in optimization for planning and operational security, efficiency, reliability and stability, and autonomous control of sustainable energy systems. Professor Philip Fanara, Jr., Ph.D.
Haydar Kurban is an Assistant Professor of Economics at Howard University. Dr. Kurban earned his Ph.D. in Economics from University of Illinois at Chicago in 1999. Prior to joining Howard University in August 2001, he had worked as a Research Assistant Professor at Center for Urban Economic Development affiliated with University of Illinois at Chicago. Dr. Kurban’s research papers (with Joseph Persky) on Urban Sprawl and Spatial Distribution of Federal Funds have been published by the Brookings Institution and Regional Science and Urban Economics. He presented his research on urban clusters, earnings inequality, and local economic development programmes in professional and academic conferences. His current research is concentrated on intra-metropolitan growth, gravity models, and economics of electrical power. Associate Professor Jide Iwarere, Ph.D.
Dr. Jide Iwarere joined the Department of Finance, International Business, and Insurance in 1986, after serving as Marketing Officer, Construction Financing, Citibank Lecturer, Applied and Managerial Economics at Kwara State College of Technology, Ilorin, Nigeria. His primary research areas of interest include: Race and Residential Mortgage Financing Decisions, Market Behavior in Emergent Land Markets, Site Selection and Location Analysis, Valuation of Power Plants in the Context of Privatization, and Contingency Evaluation and Social Impact Analysis of Electric Power System. He has taught Real Estate Finance and Investments, Real Estate Principles, and Finance Principles. Dr. Iwarere holds a Ph.D. in Business Administration (Real Estate and Finance) from the University of Georgia, an M.S. in Business (Real Estate and Investment Analysis) from the University of Wisconsin Madison, and a BSc in Economics from the University of Ibadan.